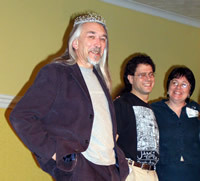 Justina Robson, Pat Cadigan and Colin Greenland enjoy a joke prior to the Borders reading . 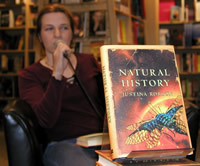 Justina reads from Natural History. My camera liked the book cover so much that it put it in focus and ignored Justina. Oops, sorry. "Am I chic or what?" 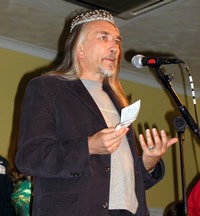 Mike Harrison revels in the ceremonial Tiptree tiara. Matt Austern and Jae Leslie Adams look on in amusement. This was Mike's favorite photo. He imagines himself explaining to his loyal subjects why it is necessary for us to invade Narnia. Mike admires the fabric cake while Ellen Klages waxes lyrical on the chocolates contained therein. The Tiptree Choir salutes the heroic Award winner.